On August 6th, the U.S. will commemorate the 50th Anniversary of a landmark and highly impactful law: the 1965 Voting Rights Act. Celebrations of the VRA will surely feature iconic photographs, such as that of President Johnson embracing Martin Luther King and Rosa Parks at the signing ceremony. Memories will be shared about the incredible bravery and sacrificed lives of Freedom Summer Workers. And, of course, speeches will recount the monumental shift in democratic participation emanating from the VRA and its undoing of political apartheid and exclusion, particularly in the southern states, where voting restrictions remained for nearly a century after the 15th Amendment. The VRA will be rightly described as momentous, historic, and game-changing. We add to this list of lofty adjectives and celebration, however, an additional descriptive: ironic. It is ironic—and certainly disconcerting—that, a full half-century after the VRA was signed into law, today we are witnessing a significant wave of voting restrictions . And who is disproportionately affected? Precisely those groups presumably protected by the VRA: impoverished non-whites. Ironic, indeed. Troubling, indeed. Our home state of Ohio is a microcosm of a nationwide pattern. For decades, the only proof of residency needed to vote was a utility bill or other document with a name and address. That all changed in 2014, when Ohio’s state legislature prohibited individuals from voting unless they could produce a government issued photo ID. Voters cannot even cast a provisional ballot without one. According to the Brennan Center for Justice and the National Conference of State Legislatures, 14 other states have passed voter identification laws, each after the election of President Barack Obama. 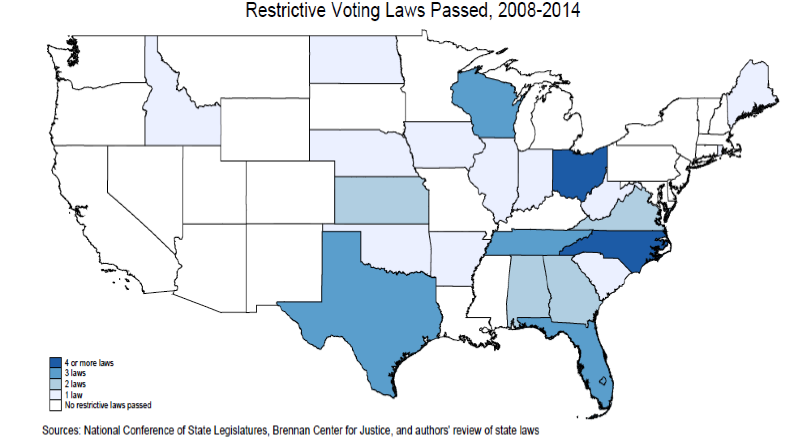 Such restrictions were bolstered by the Supreme Court’s 2014 ruling in Shelby v. Holder—a decision that invalidated Section 4 of the VRA and that, according to Scholars Strategy Network report “Forward or Back on Voting Rights,” actuated additional voting restrictions in states like North Carolina, Texas, and Mississippi. A booth at the 2012 Minnesota State Fair. 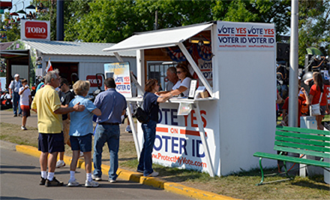 That year’s effort to require government-issued ID to vote did not pass. Flickr CC. Voter ID laws are but a small piece of a larger recent effort to make voting more arduous—at least for some. In Ohio, the same legislature that required a photo ID also pressed for the elimination of early voting and same-day voter registration—two measures initially instituted to help avoid extraordinarily long lines on election day, as witnessed in 2008 and then again in 2012. Wisconsin, having already passed a controversial voter ID law in 2011, joined Ohio by also reducing the early voting period in 2014. By our count, over the past seven years alone, at least 9 states have enacted registration restrictions, 8 changed in a restrictive direction early voting rules, 2 made it harder for ex-felons to get voting rights restored upon completing their sentence, and 2 now require proof of citizenship to cast a ballot. It is striking that such actions, which disparately impact poorer and minority populations, are occurring as we celebrate the anniversary of the VRA. Such back-peddling across U.S. states is symbolically disturbing, to be sure, but also bothersome precisely because these laws upend a decades-long period of franchise expansion among America’s citizenry in general and minority voters in particular. In fact, from the signing of the VRA to the millennium’s end, nearly all movement pertaining to voting law was in the direction of easier access and fewer restrictions. Between 1970 and 2000, several states enacted same-day voter registration to increase turnout, and most states rolled back their restrictions for ex-felons. To the degree that identification was needed to vote, it took the form of a utility bill or even the word of a neighbor brought along to the polls, not a government-issued picture ID. So why the reversal after 2008? By most indications, the back-peddling appears to be part of an organized effort by the Republican Party to obtain an electoral advantage. The tactics to gain advantage have been long-discussed but only recently moved from rhetoric to reality. Some 35 years ago, Heritage Foundation co-founder Paul Weyrich claimed that widespread voting was not necessarily in the best interest of the Republican Party. In his words, “our leverage in the elections quite candidly goes up as the voting populace goes down.” During the George W. Bush presidency, a senior attorney in the Justice Department’s Civil Rights Division, Hans von Spakovsky, carried this idea further by writing a law review article that offered a template for enacting photo identification legislation. As reported by the Washington Post, von Spakovsky’s article was instrumental, if quite controversial, in the passage of Georgia’s voter identification law.Heritage Foundation co-founder Paul Weyrich claimed some 35 years ago that Republicans’ “leverage in the elections quite candidly goes up as the voting populace goes down.” Today, that rhetoric is becoming reality. The notion that conservatives are spearheading the effort to reduce turnout is also consistent with the pattern and timing of recent legislative activity. A statistical analysis of voting restrictions by sociologist Keith Bentele and political scientist Erin O’Brien, both of the University of Massachusetts-Boston, and a state-specific account of how voting restrictions unfolded in North Carolina by Marion Johnson of Duke University each point out the significance of Republican Party strength. 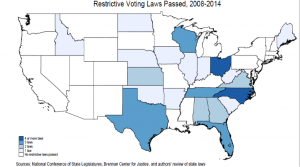 Our own analysis further demonstrates that 80% of the restrictive voting laws between 2008 and mid-year 2015 were passed by Republican controlled legislatures. Two restrictions making it more difficult for felons to regain their voting rights after completing their sentences were enacted by Republican governors’ executive action or decided by committees reporting to the governor in Florida and Iowa. Yes, Democrat controlled legislatures (e.g., Illinois and West Virginia) have also passed voting restrictions, and several states controlled by Republicans have remained idle. Yet, the association is strong, and all indications are that a concerted effort by Republicans is making voting more difficult for millions. A second notable pattern is heavier restrictive activities in battleground states—a pattern noted recently by William Hicks and colleagues in an article in Political Research Quarterly. Politico identifies nine battleground states in the 2012 election: Colorado, Florida, Iowa, Nevada, New Hampshire, North Carolina, Ohio, Virginia, and Wisconsin. These states have collectively managed to pass 18 restrictive laws and 2 executive actions. North Carolina is symptomatic of what is transpiring in other swing states. Tipping toward Obama by less than 1% in 2008, then going to Romney by a mere 3% four years later, the Tar Heel State is now a battleground. It is unlikely a coincidence that when control of state government changed from divided to Republican in 2013, four restrictive voting measures were enacted. A similar story can be told for Wisconsin, Florida, and, of course, Ohio. Ohio has been the Holy Grail of presidential politics for at least two decades. The state has picked the winner in each election since 1960, and after two consecutive narrow victories by Obama, it was evidently the right time to take a second look at voting laws. Republicans gained control of Ohio’s legislature in 2011 and, like North Carolina a couple of years later, promptly passed laws to reduce early voting and increase bureaucratic barriers to voter registration. Two years later, further restrictions surrounding photo ID requirements and the elimination of evening and Sunday voting were introduced. Neither of us is a cynic, but we’re also not naïve to the facts. Facts that show what such restrictions are: a thinly veiled attempt to limit voter turnout among predictable Democratic voters in 2016. Like the Ohio and Georgia laws, each of the other voting restrictions enacted during the past decade will disproportionately affect predictable liberal constituents—namely those residing in urban areas, the poor, non-whites, and college students. As denoted within expert legal testimony, such populations move more often (impacting their ability to fulfill ID requirements), have less access to transportation to polling places and time flexibility to go vote (consequential when voting hours and days are restricted), and tend to have more difficulty surmounting informational and bureaucratic hurdles related to registration. Conversely, case analyses, such as that undertaken by groups like the Lawyers Committee for Civil Rights, suggest that expansions to voting opportunities are significantly beneficial to poor and minority voters. By intent or design, restrictions have a disparate and negative impact on non-white, lower income voters.Advocates of the restrictions claim no intent to dampen voter turnout, but by intent or design, restrictions have a disparate and negative impact on non-white, lower income voters. Advocates of the restrictions, of course, will scoff at this assertion. They claim no intent to dampen voter turnout, instead lauding safeguards to bureaucratic neutrality, uniformity, ballot integrity, and, ultimately, democracy. “Easy to vote, hard to cheat!” is generally the stated goal of voting “reform” initiatives, and who could argue with that? Well, we just might. Voter fraud is certainly something to monitor, and in many nations it is genuinely a threat to vibrant democratic government. But the United States isn’t one of these countries. When we took a hard look at the numbers, we discovered little evidence of widespread illegal voting. In fact, it hardly exists. The New York Times reviewed five years of Justice Department records and uncovered no evidence of any organized effort to fraudulently influence federal elections. A study commissioned by Iowa’s Republican Secretary of State identified 117 possible fraudulent cases, six of which—SIX!—with enough evidence to result in criminal convictions. An Ohio study commissioned by the Secretary of State, Jon Husted, found 135 possible fraud cases out of 5.63 million votes cast in 2012. That’s an estimated voter fraud rate of 0.00002, or 0.002%. To put this in perspective, Ohio’s child poverty rate is over 20% and its infant mortality rate is 0.73%, according to the Annie E. Casey Foundation. As Rutgers Political Scientist Lorraine Minnite candidly stated after reviewing thousands of prosecutor reports, one is more likely to get hit by lighting than to engage in voter fraud.Voter fraud is certainly something to monitor, and in many nations it is genuinely a threat to vibrant democratic government. But the United States isn’t one of these countries. Any sane or disinterested observer would look at these numbers and conclude, thankfully, that fraud is not a problem. Yet, such rare instances of possible malfeasance are cited by advocates of voting restrictions as cause for alarm and underscore, in their view, the need to go beyond existing criminal penalties for voter fraud. The voter fraud statistics are cited to justify additional bureaucratic hurdles and oversight—hurdles and oversight that make voting more difficult for many. Jon Husted’s response to the Ohio study he commissioned was laughable: “Voter fraud does exist, but it’s not an epidemic.” Not an epidemic! We’re talking about less than a tenth of a tenth of a percent of all votes. Still, Husted hardly takes the cake with his response. A spokesman for Ohio’s Speaker of the House called the 0.00002 rate of possible fraud “very, very concerning.” Referring to such a low rate of suspected fraud as “very concerning” strikes us as very disingenuous. The voter fraud argument is, to be blunt, a political red herring. It is an effort to distract and vilify. To the extent that the country has a voting problem, it is that eligible voters turn out in small numbers, not that ineligible voters turn out in droves. As a result, the supposed cure to a problem that doesn’t exist will result in hundreds of thousands of law-abiding citizens across the country being denied access to the booth. This is more than illogical; it’s also unjust and undemocratic.The voter fraud argument is a political red herring, an effort to distract and vilify. To the extent that there is a voting problem, it is that eligible voters turn out in small numbers. The semi-centennial of the VRA presents us now with an opportune moment, as citizens and social scientists, to ponder where we’ve been and where we’re headed with the right to vote and the expansion of democracy. Some scholars refer to the new voting restrictions as Jim Crow 2.0. While we understand the claim, we are also somewhat more cautious in our assessment. Reducing early voting hours or requiring photo ID is a far cry from literacy tests and poll taxes. It is nevertheless important to cry foul, loudly and unabashedly, at the insulting and false claims that restrictive changes have been and continue to be undertaken in the pure spirit of ballot integrity. A more sincere effort to protect the ballot and our representative democracy would enable access to the polls, not restrict it. 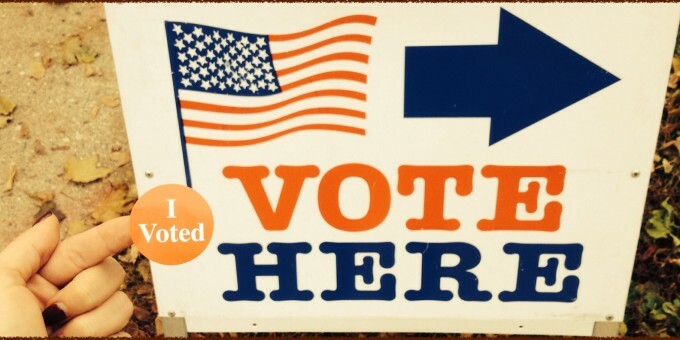 Today, photo ID requirements and early voting restrictions are spreading like wildfire. Similar laws are being discussed in more than half of U.S. states, both red and blue. We see further disenfranchisement—even the perception of disfranchisement—as deeply disturbing We already have a divided electorate, increasing levels of racial and class inequality, and our country is experiencing some of the most serious race relations problems since the 1960s. The current wave of voting restrictions will add kindling. It speaks poorly of our 240-year-old democracy and the gains made in the last 50 years if the very foundation of democracy—namely, voting—must still be fought for and protected. Ryan D. King and Vincent Roscigno are faculty in the department of sociology at The Ohio State University.